Rewarding small steps in teaching a new behavior earns the trust between the bird and the bird owner. Keeping the training sessions short and frequent can result in obvious progress. Two people have highly referred me to you. 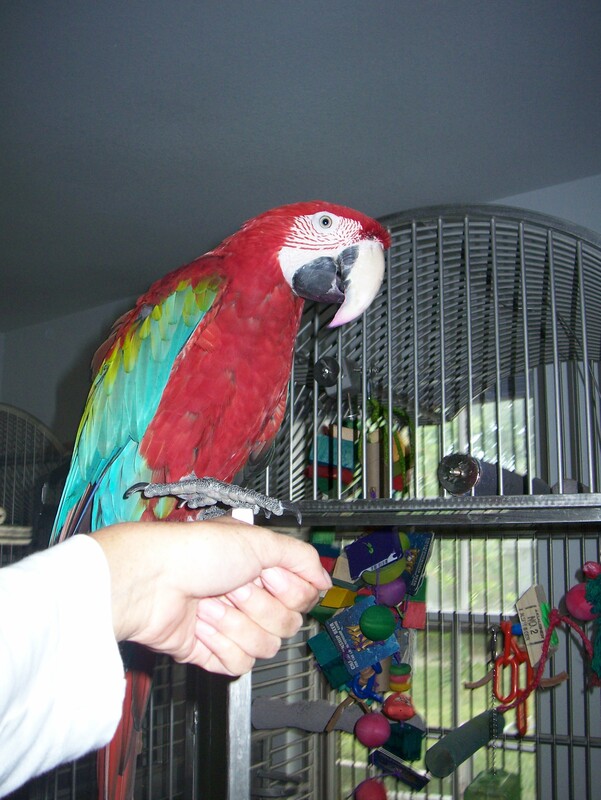 I have a blue-throated macaw and she is really nippy and pulling new feathers out. Her worse times with me is nipping. She turned three on February 21st. She needs to trust more and needs more enrichment activities. She free flies and has an aviary. From the time I got her until about the time she was a year old, I applied the positive rewards, her nipping just got worse. Then I did the earthquake and things were better. There are times she could be as sweet as can be then in a blink of the eye, she screams and nips. I am the only one living in my house. I don’t take her outside because I can predict her reaction (she flies and is scared) and I have not moved my hand. Actually I am not even touching her, just holding her against my head. I was advised to spray her even if she doesn’t like it. Well I did but now she shakes so I am not doing it anymore. She does need to be sprayed. An overhead mister that goes off if I am not around would be great. There are several things that can be addressed from your situation. First, you mentioned see needs more enrichment. Enrichment is unique to each bird just as it is to us and it is the bird that decides what is enriching, not us. It is up to us to identify their forms of enrichment and then offer them to the bird and in the bird’s environment. I was just telling someone yesterday that my birds’ favored forms of enrichment are flight games and flight training, positive reinforcement training, and foraging. I know this by watching my birds’ behaviors. If you read other entries in my blog, you will find how I define finding reinforcers and rewarding effectively. If a behavior is increasing, it is because it is being reinforced. You mentioned you’ve tried positively rewarding other behaviors but the nipping increased. If the nipping increased, it is being reinforced. It is easy to take bigger steps than what our birds are ready for. The steps need to be small and at the bird’s pace. It is also the bird that decides the reinforcer, it is never us. If behaviors aren’t changing, make sure you are not taking too big of steps and make sure the reinforcers you are offering are of high value to your bird. The best form of communication from our birds is their body language. As you are interacting with your bird, ask yourself “Does this bird look completely comfortable?” I not, you could be pushing your bird too far. Take a step back in what you are training and reward from there. If you are holding your bird and she bites for no obvious reason, I would try target training her. There is a reason and training may help you in identifying it. Target training is one of the first things I train with a bird because it develops a line of communication and it teaches the bird what you are asking and learning the new positive consequences. Positive reinforcement training is the best form of communication I have found to use with an animal, which is why I am a huge fan of it. Target training is when an animal touches a specific object with a particular body part. A very common form of target training is asking a bird to touch its beak to a stick when the stick is presented. Here is a video of Rebecca, who trained Suki the amazon to target her beak to a stick during A Day With The Trainer. I’ve target trained all of my birds to put both feet on my wrist when I ask them to step up. Yes, this is a form of target training. If they step up, I reward. I have several birds that had issues with biting or nipping and I used this form of training to train them the behavior of stepping on my wrist without biting. This is what I am training the green-winged macaw in the photo above. I’m not pushing him and I rewarded him for even putting his foot up before he stepped onto my hand. Once they do this, I reward and then ask them to step off and reward again when they do. If I know a bird has a nipping issue, I definitely do not want them nipping when on my wrist so one of the places I’ll begin is to ask them to step back off immediately before the bird has the opportunity to nip. If the bird nips twice, it is being reinforced so I want to ask the bird to step off of my hand before he has the opportunity to nip. Then I slowly begin increasing the amount of time the bird is on my wrist and then reward that amount of time. Once I ask the bird to step up and it does, I reward. Ask it to step off and it does, reward. Ask it to step back on, reward. Have it sit there for two seconds, reward. Ask it to step off, reward. Then reward for sitting on the wrist for four seconds, for six, for ten, twenty, etc. Do you see how this works? Keep training sessions short and frequent. I often train a bird for 20 seconds to a couple of minutes and then the training session is over. I’ll then come back and train again thirty minutes later and have another quick training session. Training short and frequently often is more effective than training long periods of time infrequently throughout the day. With every interaction you have with your bird you are training it. The key question is “What are you training?”. I don’t use the earthquake method if I don’t have to. The only time I’ll use it is if the alternative is worse, and even then, if I have to use it, I’ll use it once and then make sure I then work on the behavior issue causing the problem versus having to use it again. Here is the reason I don’t use the earthquake method, it doesn’t build the trust and the relationship between you and the bird when the bird is on you. If this method is used once in a while, it could keep nipping behaviors very strong because the bird may know when that method is coming, and may get nervous in the anticipation of it which could result in the sudden bite or nip. Using the earthquake method doesn’t teach the bird what you really want it to do. Teach the bird to do something else, like target it’s beak to a stick. This way if you think you may see a nip coming while the bird is on you, ask it to touch the stick instead. This way the bird knows if it touches the stick, the reward is coming and you can direct the bird’s beak away from your arm. I would then ask the bird to step off of you so a nip isn’t accidentally reinforced. When you begin the target training, I would begin when the bird is not on you, this way if you see a potential nip getting ready to happen you can avoid being accidentally bit. This way, when the bird is actually on your arm and you ask the bird to touch the stick, it is already familiar with what you are asking. How water is introduced to the bird and the consequences will be the underlying factor in the bird’s future acceptance of how it is presented. This is often how I introduce a bird to allow the hose in close proximity, prepping the bird to accept taking a shower from it. I’m glad to hear you have stopped the spraying if the bird doesn’t like it. You can train her to like it taking the same small steps in positive reinforcement training that you’ll use in target training her. I’ve trained all of my birds that the mist from the shower or the mist from a hose is a good time. The approach was different for each bird, because each bird is its own individual. Often times I’ll take the hose and shower another bird that likes it and have the bird watch. That doesn’t always work on its own though. 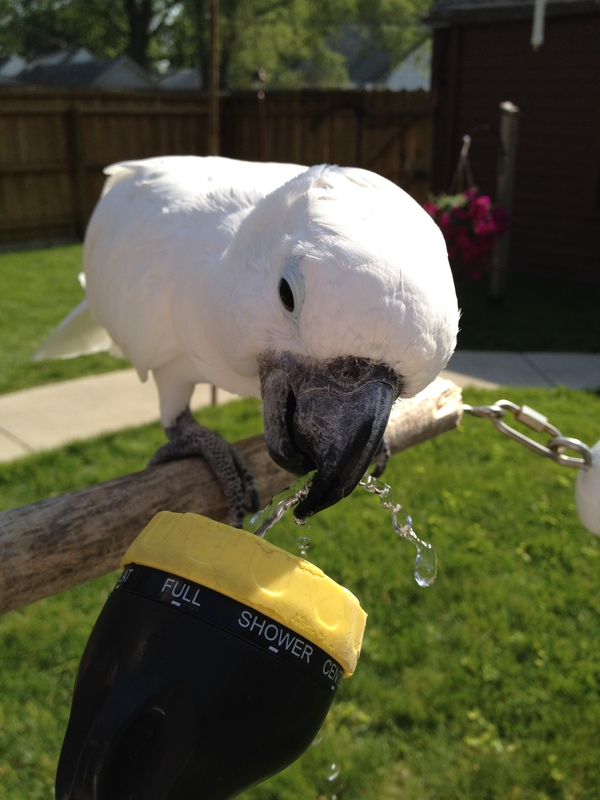 Many times I’ll have the bird drink the water from my hand to introduce it to the water coming from the hose. Then I’ll introduce the hose in close proximity and reward the bird for allowing the hose in close proximity. Then I’ll reward the bird from drinking from the hose. My goal is to reinforce calm behavior while in close proximity to the hose. Once the mist gets so close to the bird, I may have a few droplets of the mist touch the bird for a quick second and then reward with the bird’s positive reinforcers. If that is too much for the bird and it shows any sign of nervousness, I take a step back in introducing the mist to the hose and start over. Often times in this house, the bird’s positive reinforcers are attention from me and for the bird to hear how good they are. Slowly I begin having a few drops of mist hit the bird’s wing very quickly and frequently, each time reinforcing heavily. This pairs the bird’s most valued reinforcers with the mist hitting its wing. If I use the reinforcers effectively, the bird will begin looking forward to the presentation of the hose. 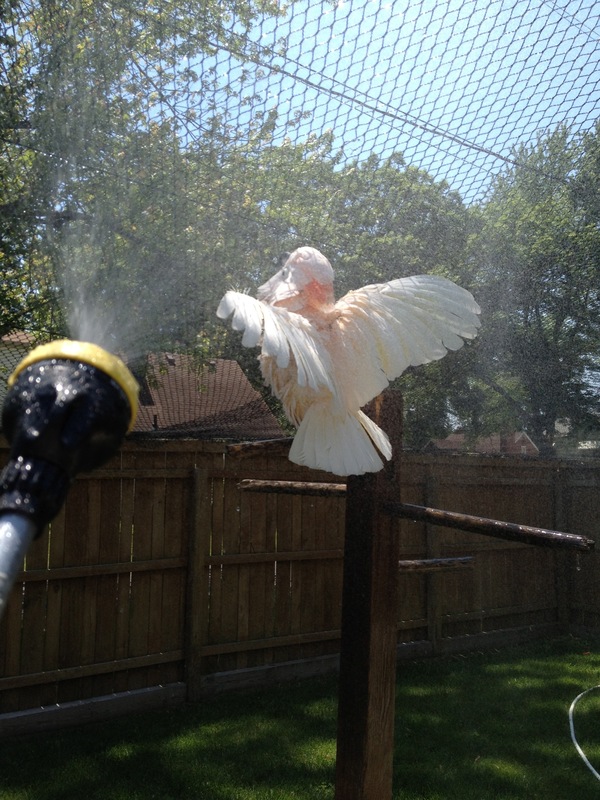 After positively reinforcing the introduction of the hose into the bird’s environment at the bird’s pace, I’ve seen most birds enjoy the opportunity for a shower.